Choosing the right wood for a project is probably one of the hardest things a woodworker has to do. Typically for myself, the process of elimination comes down to which color and grain pattern. But occasionally I need to consider durability, and that’s when I need a little help. Recently the folks over at Gate Expectations created two handy infographics to help woodworkers make an informed decision. Check them out! 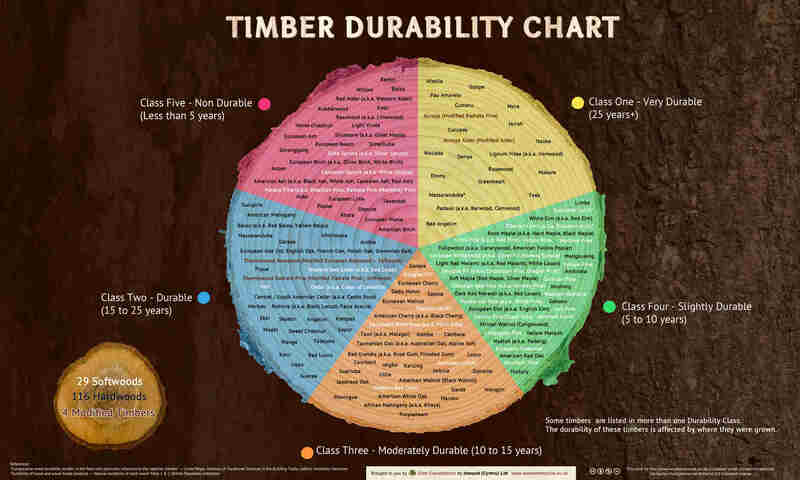 Use this quick-reference chart to determine which class of durability your timber selection falls into. Cool durability chart. Thanks for sharing it. One problem: those Gate Expectations folks need to switch their durability chart’s “Class One” and “Class Five” sections, so that the thing reads in order (circumferential). As stands right now, the reader’s eye has to bounce back and forth to follow the classes in order, and so one dimension of information is lost (i.e. what species of wood are on either side of a class cut-off). Thanks for sharing it Matt. Anyone else notice that western red cedar is in both class two and class three? Maybe one of those was supposed to be eastern red cedar, because I don’t see it on the chart and it’s a pretty darn rot resistant wood! In the bottom right of the chart it explains it. Some woods are listed in more than one class, durability is affected by where they were grown.